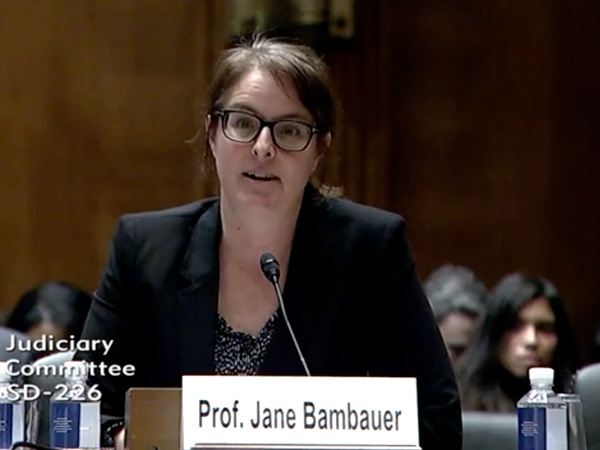 University of Arizona James E. Rogers College of Law Professor Jane Bambauer testified before the Senate Judiciary Committee last month in a hearing on data and privacy. Her testimony warned that new stricter privacy laws in Europe (the General Data Protection Regulation, or GDPR) and California (the California Consumer Privacy Act, or CCPA) could harm innovation and consumer welfare. "The short-run effects of GDPR have not been good for the European economy," Bamabauer told the panel. She added that the CCPA is "likely to cause similar effects." Bambauer’s testimony went on to highlight the unintended effects of data privacy defaults and that, while it’s often assumed that privacy benefits consumers, that isn’t always the case. She pointed to a study that found that home loan applicants living in California counties with privacy as the default—meaning consumers are required to opt-in to allow their data to be shared—paid higher interest rates and defaulted at greater rates than counties that defaulted to more open data flow. "Our collective instincts about Big Data tend to be inaccurate and pessimistic,” Bambauer said. In her remarks she recommended that the U.S. should “avoid regulations where the harms were speculative or nonexistent” and instead rely on existing regulators such as the Federal Trade Commission to use their expertise to identify and deter harmful activity while allowing activity that spurs innovation. Bambauer’s written testimony also included a draft privacy bill outlining policies that she says strike a balance between truly protecting consumers where needed while also avoiding regulations that unnecessarily restrict innovation. The hearing also included testimony from additional data and privacy analysts and executives from Google and Intel.